Though Peter Brook’s production of A Midsummer Night’s Dream was originally premiered on 27 August 1970 at Stratford-upon-Avon, in 1972 it was chosen by the British Council for an East European tour, and the company performed it in Belgrade, Budapest, Bucharest, Sofia, Zagreb and Warsaw. 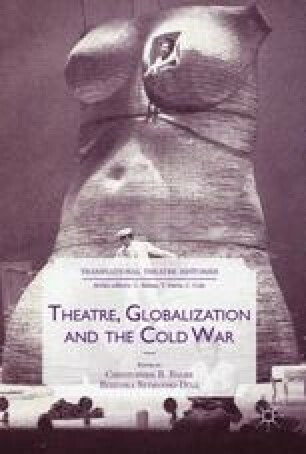 The article focuses on the RSC’s (Royal Shakespeare Company) East European tour and investigates the role theatre and theatre touring played during the Cold War. Reading the critics’ reviews, the Eastern European authorities’ (secret) reports and the ongoing correspondence between British officials in East European capitals and London, the article maps the different dreams that Brook, the British officials, the East European authorities and audiences had. Analysing their dreams, the article argues that theatre was inter/cross-cultural even in the harsh political, ideological and social circumstances of the Cold War; and that the visit of the Royal Shakespeare Company was regarded as a complex sociocultural and political event on both sides of the Wall. This essay is based on an earlier article by the author in Hungarian: Zoltán Imre, ‘Szentivánéji álmok: Peter Brook kelet-európai turnéja a hidegháború idején’ (A Midsummer Night’s Dreams: Peter Brook’s Tour of Eastern Europe during the Cold War), Irodalomtörténet 45(95) 1 (2014), 90–113.